I had a party to go to. Shopping takes time and money, both of which I didn't want to dispense. But I still wanted something new and cute. I am not at all well versed in the apparel world, but I can sew non-apparel like it's nobody's business. I seem to have a knack for figuring out how things are made, but if I can do that regarding apparel then it must be easy. Let's make an easy skirt! 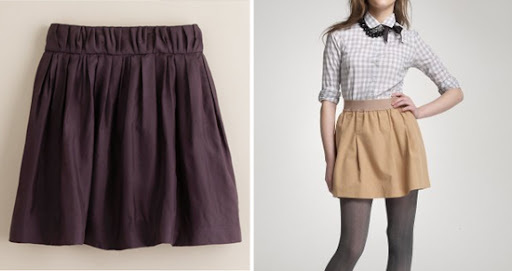 I feel like the elastic-waist skirt trend has emerged solely so that I may feel some sense of apparel-accomplishment. These skirts are everywhere. Here they are at J. Crew - examples of the two variations, exposed elastic and covered elastic. I like both, but the covered elastic is easiest so that's what I'll share here. Let's save $90! You'll need 4.5" for the elastic channel and 2.5" for the hem (I like a wide hem). I wanted this to hit just above my knees and for me this was 17.5", make this shorter or longer, whichever you prefer. My total in length, therefore, was 24.5". My waist is 27" and I made my width 46", a little shy of double. Make sure to include about an inch or so for your seam allowance. Pre-first, press your fabric! First, cut your rectangle according to your length and width. After this, I serged all of my edges. Don't worry if you do not have a serger, it's not crucial. Next, fold your rectangle in half, right sides together, meeting the two short sides. Pin in place. 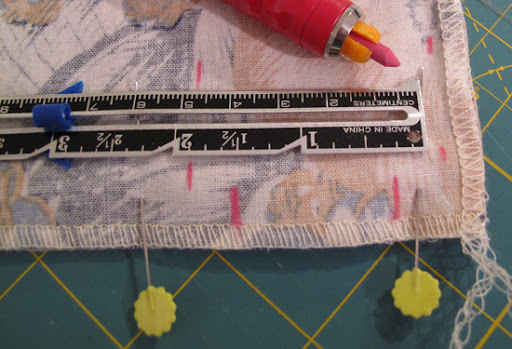 You'll need to mark your fabric to create an opening from which to insert your elastic. From what will be the top of your skirt, mark an opening about 1.5 wide within the space you've alloted for the channel (should be 2.5" from the raw edge, or about 3" if you're not serging the edge). Now stitch along the raw edge giving yourself a decent seam allowance and not stitching in the 1.5 inches you've saved for your channel opening. Finish the seam in which ever way you prefer and press open. I put two small button stitches at the top and bottom of my channel opening to keep the opening secure (this can be seen a few photos down). Next, create the hem. At the what will be the bottom of your skirt, fold in about a quarter of an inch of your fabric (the long side) and press in place. Again, fold this end in, but 2". Press and pin. Using your sewing machine, sew the your hem. I think blind hems are nice and that is what I did with my machine. See our tutorial on how to do it by machine here, or by hand here (at the end of the post). Now create the channel for the elastic. Working with the last remaining raw edge, this is the top of your skirt. Because I serged this edge, I did not fold it in, but if you haven't serged, fold this edge in about a quarter of an inch, just as you did with your hem. Now fold in again 2.5", press and pin. Something I do to keep me feeding my fabric in at the correct place is make a pencil marking on my machine. I've done so in this case, 2.25" from the needle. Now stitch, at 2.25" inches from your top fold, along the width off the skirt. Your tube is finished! Test your elastic on your waist to find the correct length for you and then add two inches. I cut mine at 24" (22" for waist, 2" for seam allowance). Doing this next time, I may give myself an extra half inch or inch, it's quite snug. Mark both ends of your elastic 1" in. Place a large safety pin on one end of the elastic and feed it into your channel opening. Try to keep the elastic flat inside and work it through until you pull it back out of the opening. Make sure that your elastic is not twisted inside the channel and pin the two raw edges together (inside faces together). Stitch them together at your 1" marking. Open the seam and stitch the two ends to the elastic, creating a ring without parts poking out. Adjust the elastic inside the channel and you're done. 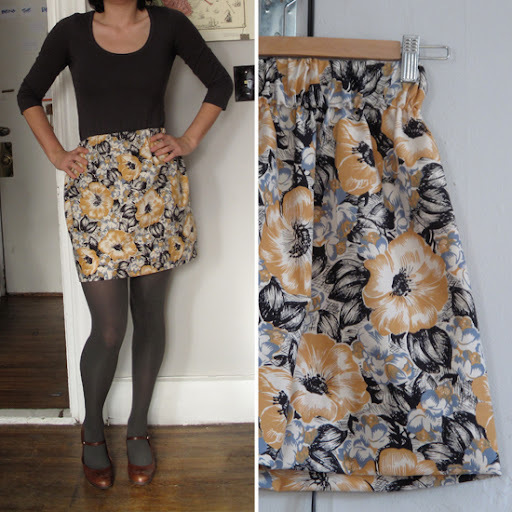 Easy skirt! It's also a cheap skirt. The fabric I used was by Nancy Gere (Helena Collection, here) Fabric purchased and Marden's for $2.99 a yard. The elastic was under a dollar. I didn't any new threads or tools for this so it cost me under $5. Wow. A final note, when the skirt was finished, I felt like it was too long. So I folded my hem in 3" more inches and hand blind stitched it in place. I'll pull the stitch out later and wear it work. I just wanted to let you know that I just made this skirt, but a little differently, because I needed to make it double thickness so it wouldn't be see-through. Thanks for the great tutorial. I actually made this skirt yesterday. I blogged about it here http://unusualform.blogspot.com/2010/10/skirting-issue.html and linked back to you. you have such great attention to detail! i really appreciate your close-up pics. Does anyone have suggestions on how to line this? I am going to use fabric that is mostly white. What is the best type of fabric to use for this skirt? The pattern is so simple it suits a range of fabric so it's really up to you. It could be a lightweight cotton/linen for summer or a fun velvet for the fall.